Hope all is well. I am writing to share some alarming signs of Bitcoin price manipulation. Bitcoin price is about 10 times of what it was a year ago. The exchange that decisively sets Bitcoin price is Bitfinex, a secretive institution with unknown beneficiary structure and place of organization. Bitfinex had its wire services suspended by Wells Fargo in April. 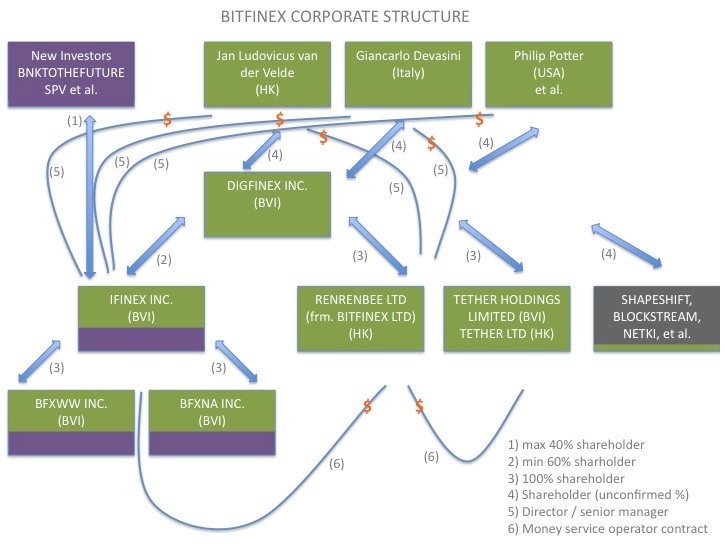 To resume trading, Bitfinex enlisted the help of Tether, another company with unknown beneficiary structure and place of organization, but based on announcements is likely under common share holder control with Bitfinex. Tether sells crypto-tokens known as USD Tethers, or USDTs, that are purportedly backed by an equal number of US dollars. In other words, each USDT is a digital good priced at USD 1.00. Despite the promise of “100% reserve” and the vague reference to “24×7 access to your funds” on Tether’s website, there is no contractual right, either tacit or express, for one USDT to be redeemed for one US dollar. It is probably through this legal construct that Tether hopes to characterize its USDTs as digital goods and not “convertible” virtual currency covered by FinCEN regulations. It is doubtful that these exchanges perform meaningful due diligence beyond identity verification to combat money laundering, financing of terrorism, and corruption of politically exposed persons. Bitfinex, for example, requires no identity verification at all for most trading activities and imposes no trading amount limits on unverified accounts. The enablement of these exchanges where rampant money laundering is possible is outside of the scope of this note. Instead, I would like to bring to your attention the distinct possibility that Bitfinex, as the likely controller of Tether, is a bad actor. Strong circumstantial evidence suggests that Bitfinex is creating USDTs out of thin air to prop up Bitcoin prices. Namely, Bitfinex is likely acting as a central bank that issues a fiat money called USDTs. The sole mandate of this central bank is to enrich itself through market manipulation. The first image (above) attached to this email illustrates how mysterious amounts of USDTs were minted and injected into Bitfinex at precise moments when a crash seemed imminent. The second image (above) illustrates a strong correlation (but admittedly not causation) between the total amount of USDTs in circulation and Bitcoin price. Bitfinex released an internal memo in September to allay concerns that USDTs might have been created at will. The memo purportedly shows that Tether maintained sufficient US dollars to match all USDTs in circulation as of a day in September. The memo, however, is of no probative value. Among other strange things, the author of the memo didn’t verify with banks (names redacted) that account balances from Tethers were in fact correct, couldn’t promise that the balances weren’t overnight borrowings for purposes of producing the memo, and couldn’t promise that Tether indeed had access to those funds. I therefore urge you to consider the possibility that the current price of Bitcoin is the result of Bitfinex’s manipulation and may collapse when regulators take action. For example, Tether is almost certainly an administrator of virtual currency — it centrally puts into and withdraws from circulation USDTs, a virtual currency squarely intended as a substitute for real currency as admitted by Tether in the internal memo. Tether has nominally registered as a money transmitter with FinCEN, but it is unclear if they fulfill any of the BSA filing requirements (e.g., filing SARs).2 As a company, Tether’s USDTs enables large crypto-currency exchanges (including US-based exchanges like Poloniex) to exist and powers trades thereon in the amount of millions every day. So it wouldn’t be surprising if FinCEN eventually decides to enforce its rules against Tether as it did against Liberty Reserve. Further, CFTC approved recently various swap execution facilities, designated contract markets and derivative clearing organizations with Bitcoin flavor. And the Chicago Mercantile Exchange is expected to launch cash-settled futures on Bitcoin soon. Manipulation of Bitcoin prices referenced by these entities is prosecutable by the CFTC, an agency with broad statutory authority to prosecute manipulation of commodity prices under the Commodity Exchange Act (including Section 753 as amended by the Dodd-Frank Act.). Although none of these CFTC-registered entities are currently including Bitfinex in the calculation of their Bitcoin reference rates (CME used to), it is well understood and could be easily established (partially because of the transparency of Bitcoin blockchain) that Bitfinex-initiated price movements ripple through all exchanges via manual and automated trading.3 CFTC could then have grounds to investigate Bitfinex’s possible manipulation of Bitcoin price via Tether. If you are considering investing into Bitcoin at this time, please look closer at the exchanges involved in price discovery and give it a second thought. Share the post "A note from Bob on the transparency of Tether"
This entry was posted in Bitcoin, Cryptocurrency, Finance, Guest post, Market research by Tim Swanson. Bookmark the permalink. Please Google “BTC-e Tether” and write part 2 of this great legal-risk breakdown. Quick nit for the sake of historical accuracy – Poloniex predates Tether. USDT-denominated trades make up under half (perhaps 40-42%) of its volume. Very significant, but it seems likely that Poloniex would survive as a coin-to-coin exchange without USDT. While I agree with the points you raise, the linear regression is questionable at best. Most cryptocurrencies would correlate with each other, either in price or in “market cap”, just because they are rapidly rising and part of the same space. Correlation doesn’t imply causation. 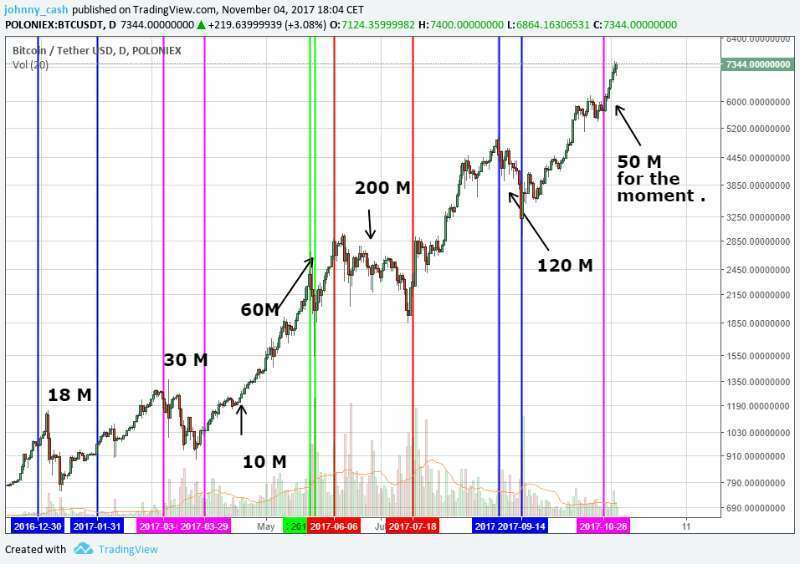 Do you expect this USDT “bubble” to burst in 2018? I see and acknowledge the mentioned points. But how do you explain then that the price for Bitcoin at Bitfinex is constantly LOWER than on the more serious exchanges like Bitstamp and bitFlyer? There’s no way to arbitrage it on a pure basis, by wiring in money. It swings both ways. Think of it like the ‘basis’ of a futures contract, since BTC on Bitfinex is priced by reference. It has trended lower lately because, well, basis has been negative, because of forks and such. Any hedge funds that can get credited Tether and buy BTC at a discount are going to be able to withdraw it and make a profit. Who are those funds? Seems like there can only be a margined trade to hedge XBTUSD swaps, for example, and buy extra-long at the lower price, and bear the cost of funding. Since that cost of funding is broadly negative lately (shorts have to pay) and it’s a negative cost to borrow USD, it’s not really an arbitrage, but a speculation. When it swings the other way, it’s the same. I’d bet this highly correlated with funding rates elsewhere. 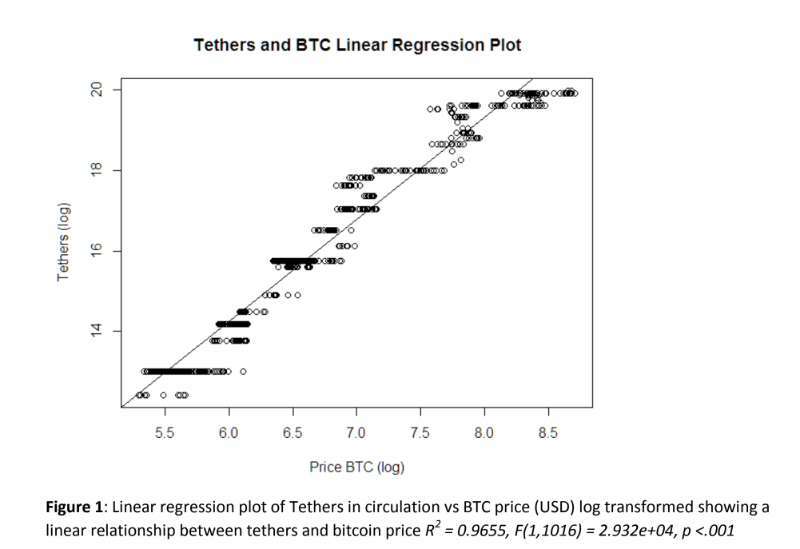 Paragraph 3 logic is flawed out the gate, Tether is a clever internal mechanism to account for BTC sales to get around regulation and relax reserve liquidity requirements; it would never be ‘credited for sale at a discount’ as that would be the same as giving discount price for buying BTC in bulk, never happen. Furthermore, Tether would never be purchased by itself, that would be like buying a blank deed form template for a house, doesn’t mean anything on its own. The only way price manipulation *could* be happening is if Bitfinex is ‘faking’ the sale of BTC, which is possible. But more than likely is just a means to get past regulation AND/OR prevent 100% reserve cash equivalent holding requirement, this way they can operate worldwide AND/OR use some reserve cash to advance infrastructure of exchange platform. I’ve read an article that stated that the reason why prices are so low on Bitfinex compared to – say GDAX – is because there isn’t enough funds and consumers are reluctant to trade on their platform. I think this article explains it sufficiently. Also, consider the fact that Bitfinex suspended US trading recently. I believe it is because Bitfinex understands that the US has strong consumer protection laws and would be willing extradite/prosecute Bitfinex executives if they were involved with US securities fraud. Its all adding up to be very, very sketchy. If I see well in the first picture, BLOCKSTREAM is part of the same family… the BLOCKSTREAM “controling” Bitcoin devs amoung others? I hope we can end this evil scheme asap. all Crypto community will be affected and better now than later. in any other environment if a financial organization took in funds and issued a “chit” or token for the purpose of buying goods, property of services that entity sells, with the guarantee of holding in reserve a matching fund, that fund would be audited on an ongoing basis and the findings of the audit would be published for the benefit of the public. plain and simple. no such audit of usdt exists. and…. everyone seems to have forgotten bfxs promise to produce an audit of their internal financials earlier this spring. it does not take this long to produce an audit. publicly owned corps across the globe release quarterly statements. CME has a critical flaw for launching Bitcoin Futures regarding CFTC’s approval for it, I think. CME and Tether company has some common interest indirectly for Tether-Bitcoin price paring system. You can find out the reference/evidence, below. 1. When CFTC review CME’s application for Bitcoin Futures, should CFTC consider this matters? So if I’m understanding correctly, this will collapse the entire market, right? What starts as tether being pumped into Bitcoin on Bitfiniex can end up as part. of an Ethereum token on Poloniex. It effects all cryptocurrencies, all exchanges. I think the futures market represents an exit plan for the people behind Tether and Bitfinex. If they’ve been supporting the price of Bitcoin, they must have amassed a large holding of bitcoin. With large stakes fake USDT (infinite in theory) and Bitcoin they can choose to push the price of Bitcoin either way however they feel depending on the most profitable contracts on the futures market. They would effectively milk profit from the futures market, without transfering any money from the cryptosphere through the real world banking system! The perfect crime with no paper trail!